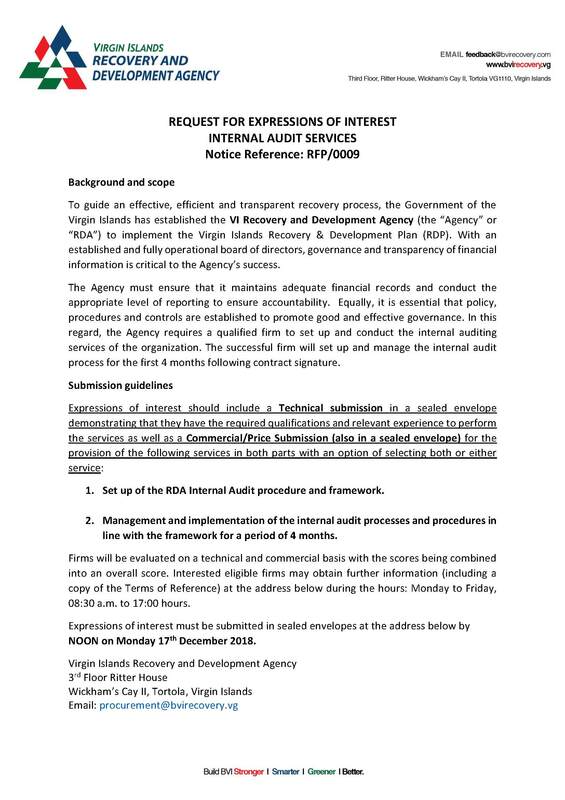 To guide an effective, efficient and transparent recovery process, the Government of the Virgin Islands has established the VI Recovery and Development Agency (the “Agency” or “RDA”) to implement the Virgin Islands Recovery & Development Plan (RDP). With an established and fully operational board of directors, governance and transparency of financial information is critical to the Agency’s success. The Agency must ensure that it maintains adequate financial records and conduct the appropriate level of reporting to ensure accountability. Equally, it is essential that policy, procedures and controls are established to promote good and effective governance. In this regard, the Agency requires a qualified firm to set up and conduct the internal auditing services of the organization. The successful firm will set up and manage the internal audit process for the first 4 months following contract signature. 1. Set up of the RDA Internal Audit procedure and framework. 2. Management and implementation of the internal audit processes and procedures in line with the framework for a period of 4 months. Firms will be evaluated on a technical and commercial basis with the scores being combined into an overall score. Interested eligible firms may obtain further information (including a copy of the Terms of Reference) at the address below during the hours: Monday to Friday, 08:30 a.m. to 17:00 hours. Expressions of interest must be submitted in sealed envelopes at the address below by NOON on Monday 17th December 2018.